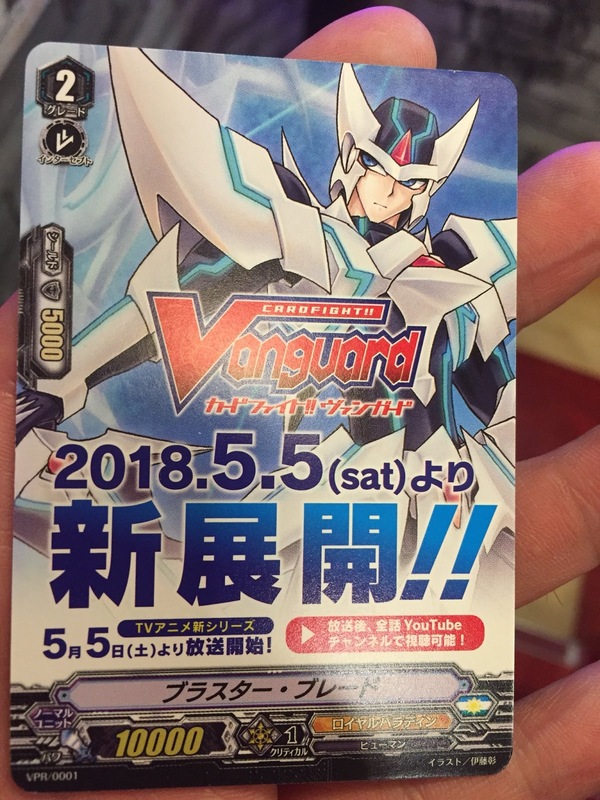 The first promo card of Vanguard's new era has gone out in Japan, distributed at demo workshops for the game's new mechanics. Each card is a base 10000 Blaster Blade with 5000 shield, with an advertisement for the anime series printed in place of skill text. These stats may sound par for the course for a vanilla grade 2 coming from the old Vanguard, but in the Standard-format game most grade 2s already have 10k base power, and the vanillas seen thus far have 10k shield. "A new work begins May 5th, 2018!! The new TV anime starts broadcasting Saturday May 5th! You can watch the whole series on the official YouTube channel!" 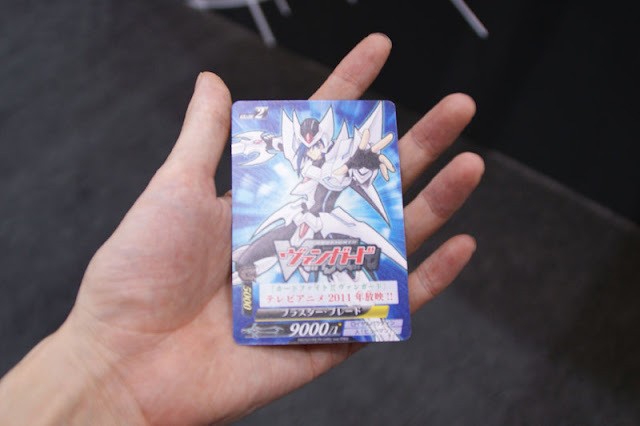 Although the card is numbered VPR/0001, it does not have the V-era symbol found at the bottom left of Alfred Early and upcoming Trial Deck cards. Some fighters in Japan have taken to going to multiple demo events to acquire additional copies of the promo. This 2011 photo, taken at that year's Tokyo Toy Show, was among the first Vanguard-related images circulated on the web. The text reads "Cardfight!! Vanguard TV anime airing in 2011!!" This is not the first time Bushiroad has slapped an anime advertisement on a card, rather than vice-versa. When Cardfight!! Vanguard was being brought out to toy and hobby shows in late 2010 and early 2011, the company distributed two similarly-structured Blaster Blades. 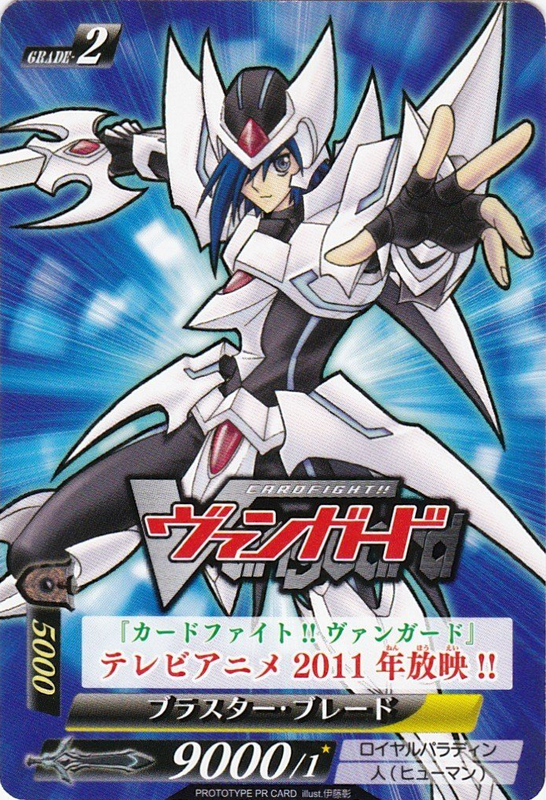 The first was based on a prototype card design from before Nakamura Satoshi's team had finalized what Vanguard's aesthetic would be, using artwork drawn by Studio TMS of Aichi in Blade's armor. The second was after the cards' frame and format had been decided on, and was distributed alongside the Stardrive and Crested Dragon Flash Fight half decks at demo events and in issues of KeroKero Ace magazine. (A third-party predecessor to Monthly Bushiroad.) 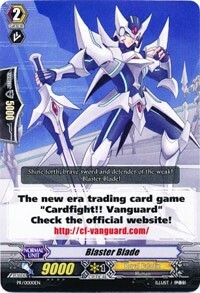 The alternate artwork used in this vanilla version of Blaster Blade is often pointed to as the origin point for the character Blaster Dark (née Junos/Yuunos) who in lore lacked the courage to use his sword's hidden skill. "The new era trading card game "Cardfight!! Vanguard"
The new anime series, codenamed "Origin," will begin airing May 5th, 2018, on TV Tokyo and affiliated stations. It will be simulcast with English subtitles on YouTube and Crunchyroll. 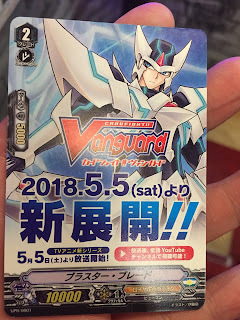 V-Trial Deck 01: Blaster Blade and V-Trial Deck 02: Dragonic Overlord will launch in Japanese May 11th, 2018, and in English June 8th, 2018. V-BT01: UNITE! TEAM Q4! will launch in Japan May 25th, 2018, and in English June 22nd, 2018.